Hi friends delighted to see the enthusiastic participation in my Celebration Events...Thank you so much ! 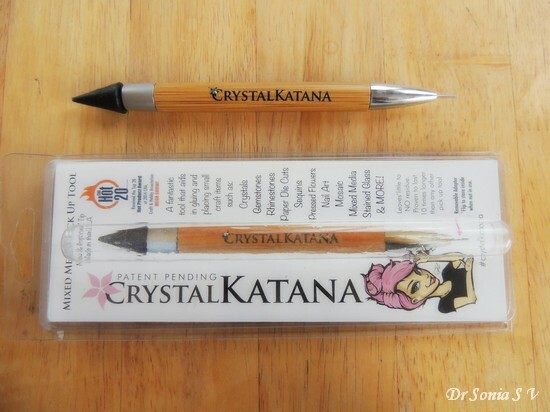 When Shalini [owner of Crafters Corner] asked me what product I wanted to work with for my DT post .....I had no hesitation in choosing 2 tools from Crystal Ninja... the Crystal Katana and the Tanto which have been getting rave reviews from crafters all over the world and being recommended left and right by jewelry makers, papercrafters and DIY ers! 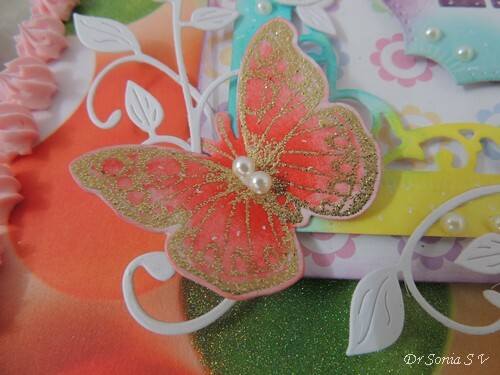 If you are like me you must have marvelled at how crafters use tiny pearls so extensively in their projects making beautiful eye-catching lattices and borders and wondered how they had the patience to work with those fiddly little embellishments! 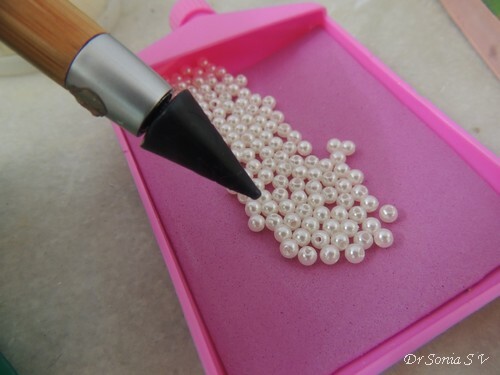 I don't have super nimble fingers or the patience of a saint ,neither do I like to wrestle with tweezers and a tiny sequin or chase runaway flying pearls! 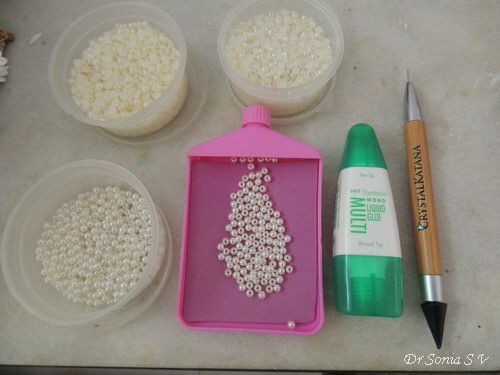 So I was just itching to get my hands on a tool which will help me use all those tiny pearls and crystals in my projects! 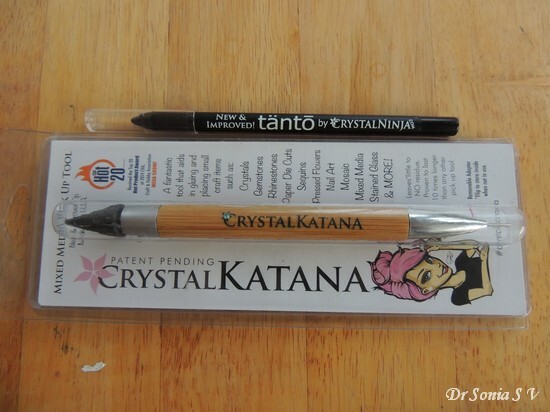 Ok what exactly are the Crystal Katana and Tanto? In simple language these are "pick up" tools to help pick up any tiny teeny embellishment such as pearls, sequins , tiny rhinestones etc .And so these tools make your crafting easier, quicker and more fun!! These awesome tools were invented by Kellie DeFries who works extensively with Swarovski crystals and has used the Crystal Katana to completely cover in crystals some crazily huge stuff such as cars, whole dresses to name a few ...there are several you tube videos showing her cover a Ferrari in Swarovski crystals using her tool the Crystal Katana for the Guinness record! 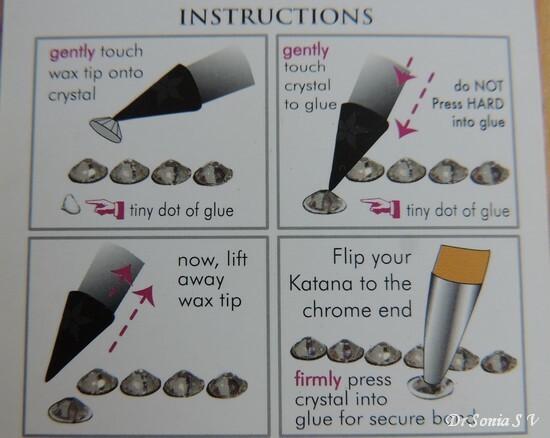 Optional- move it around or press it using the chrome metal end of the Crystal Katana ! In this video my little girl helps me to demo the Crystal Katana for you....Please do forgive the little errors that inevitably creep in ! 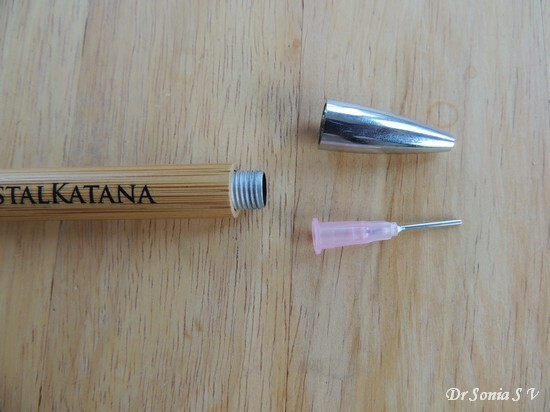 One big advantage over competitor pick up tools is that both the Katana and the Tanto quickly release the pearl/rhinestone when it is touched to a glue drop. 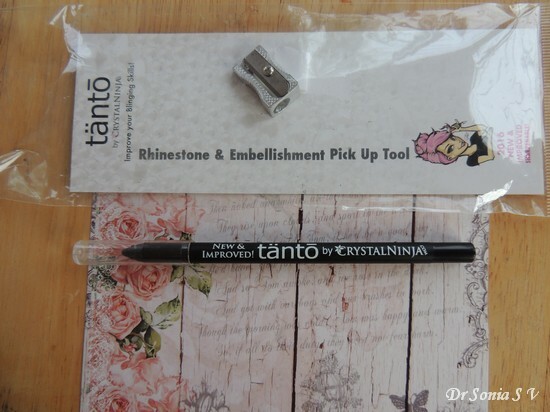 Before I got the Katana , I had bought a Silhouette pick me up tool which is super for quickly picking up tiny pearls and beads but refuses to let go of it once it picks it up...requiring additional effort of using some other tool to release it ! 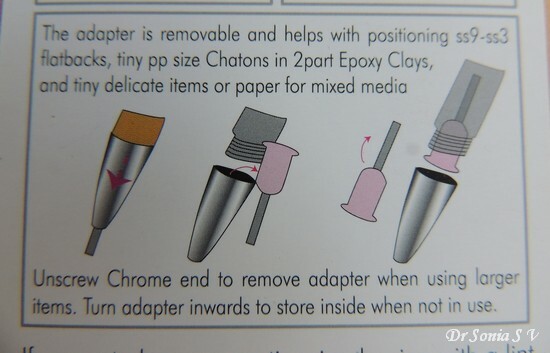 The Chrome metal end can be used to firmly push the pearl/crystal etc into the glue or move it around to get a perfect positioning! 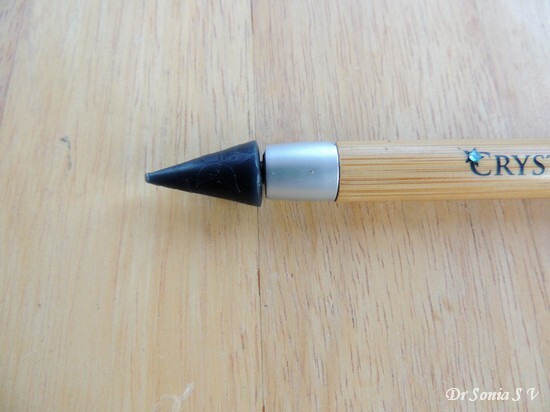 The metal end itself is a two in one tool with two diameter tool options. 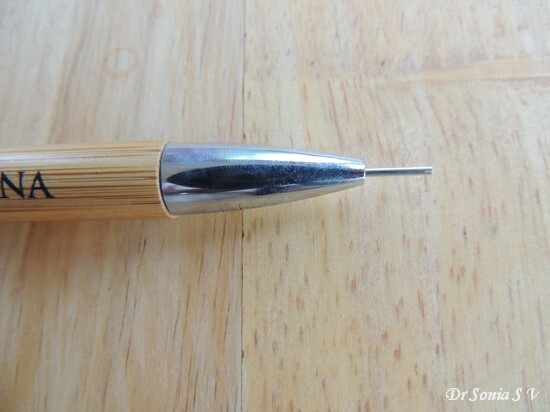 It can be unscrewed like a pen tip and you can store the thinner pointed nib inside and just use the larger diameter tip - an important feature for jewelry makers who play with teeny tiny crystals and larger crystals/beads ! 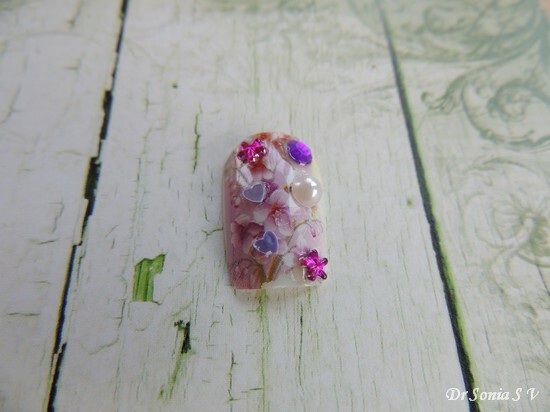 If you like working with beads or other tiny embellishment the bead funnel tray is a nice investment...it has a screw on cap which you can open once you are done to put away your glitter/beads back into the bottle. 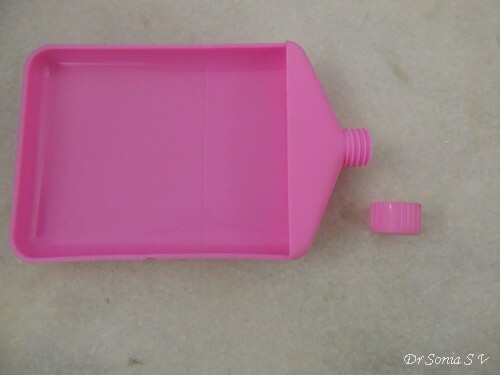 I lined the funnel tray with a piece of foam so that my pearls don't run away too much! 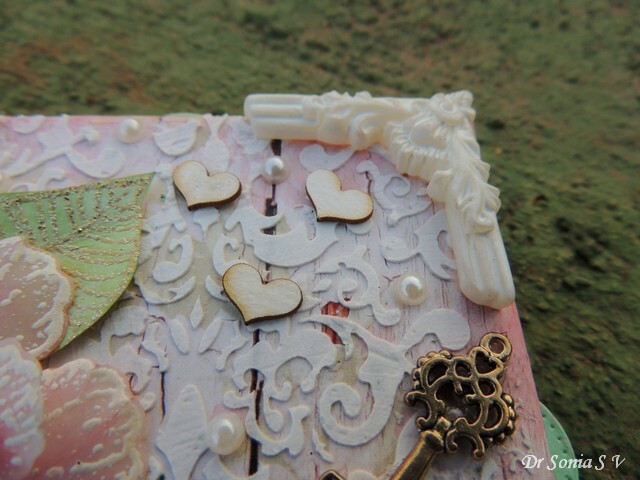 With the Katana it hand it was easy to add tiny pearl bodies to all the butterflies on my project! 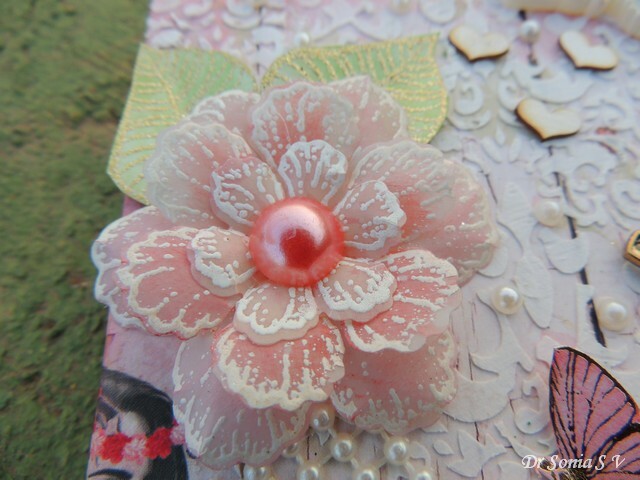 A thin line of Tombow glue - prefered Tombow mono multi over my usual Fevicol mr in this setting as I wanted to work quickly and wanted a strong long lasting adhesive.Tom bow is nice and tacky and the pearls won't fall off easily. 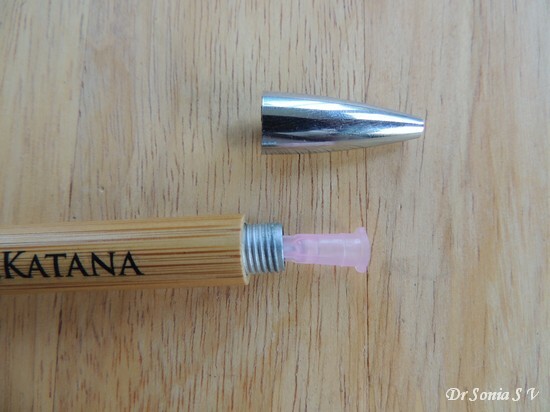 See how the pearl stays stuck to the tip. 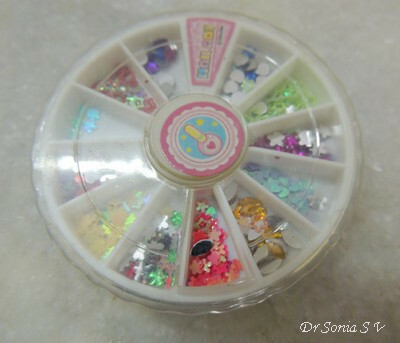 Yes easy peasy without struggling with clumsy fingers and flying pearls! 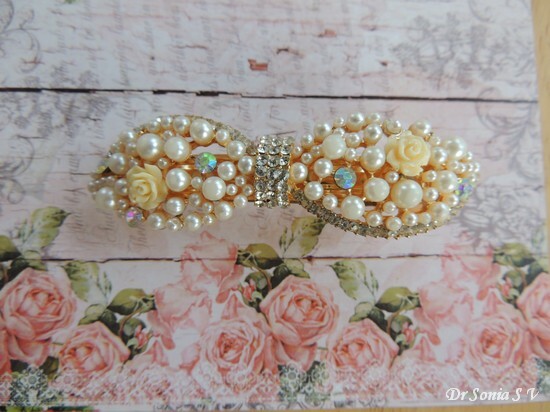 One more butterfly dressed up....Such a lovely touch a few pearl add on isnt it! 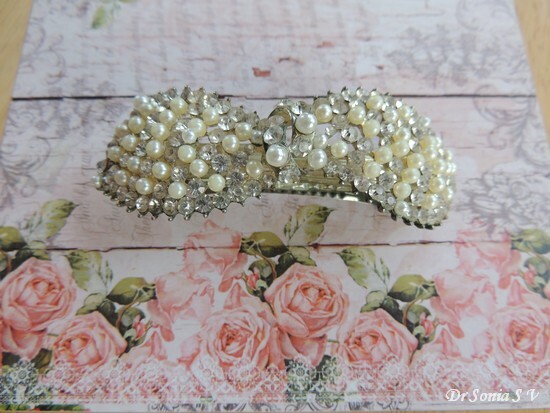 Some of my favorite hair clips had lost some tiny crystals and pearls and I had been postponing even attempting to repair it till I got the Crystal Katana ! 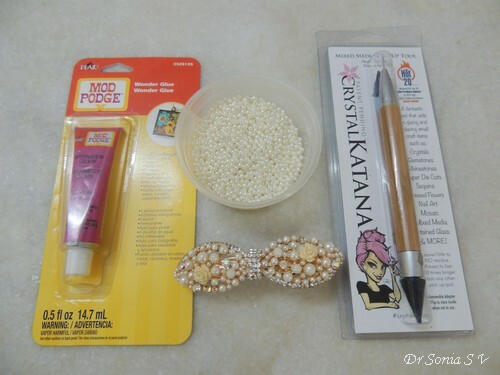 Used jewelry grade Modpodge wonder glue and the Crystal Katana to repair it and now they are as good as new! 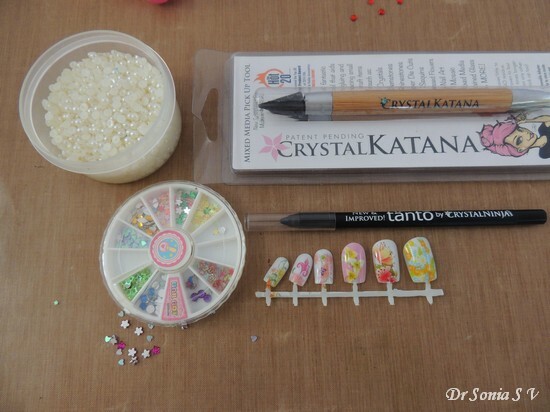 The Crystal Katana is extremely popular with nail art artists and you will find innumerable videos on you tube about its use in nail art. 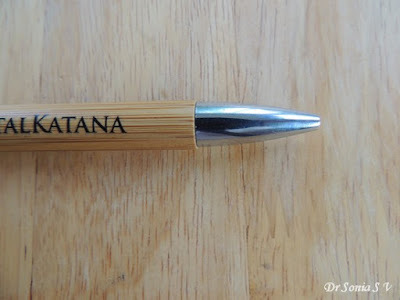 What is the Tanto ? 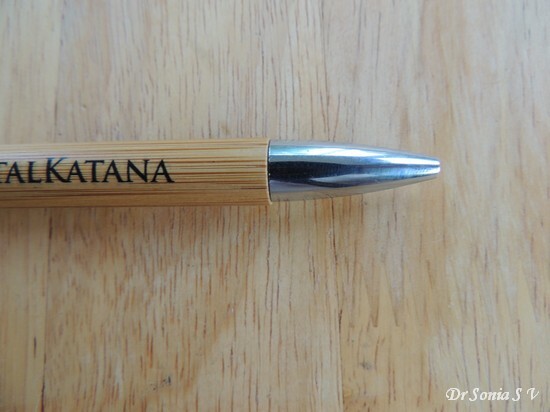 The Tanto is the economical version of the Crystal Katana . It will last a looong time! 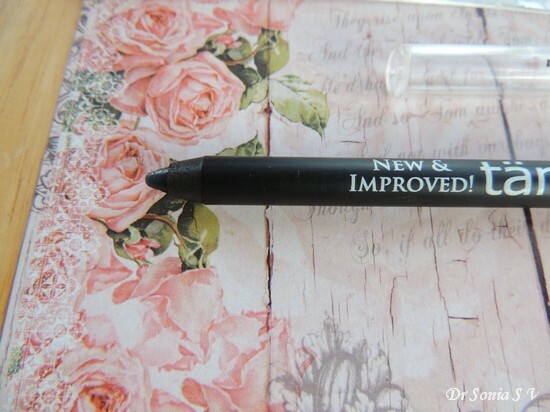 I hope you enjoyed seeing this luxury tool in action! 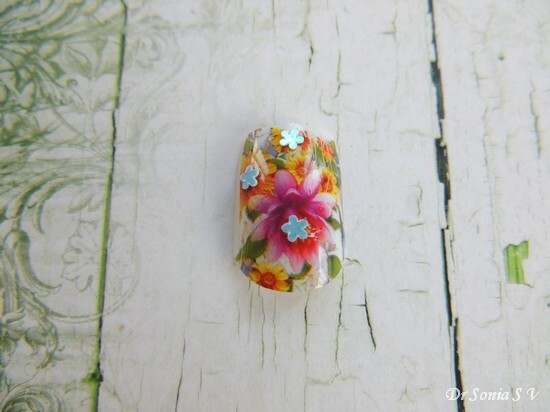 Hi friends posting the final giveaway [Giveaway No 14]of my 5 million page view celebrations. 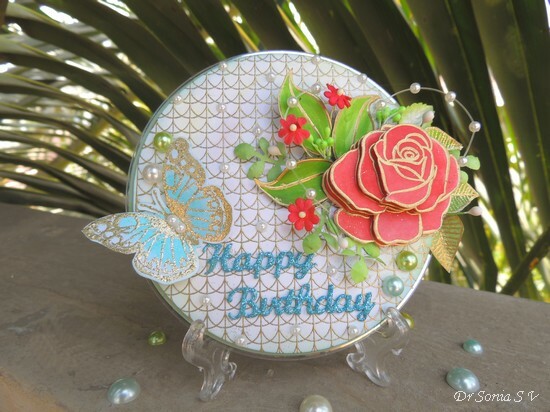 Knowing that the majority of my readers are papercrafters I bet you will love this giveaway sponsored by a new Designer Paper brand called Bob n Betty owned by a brother - sister duo Rishabh and Deepika Sharma. 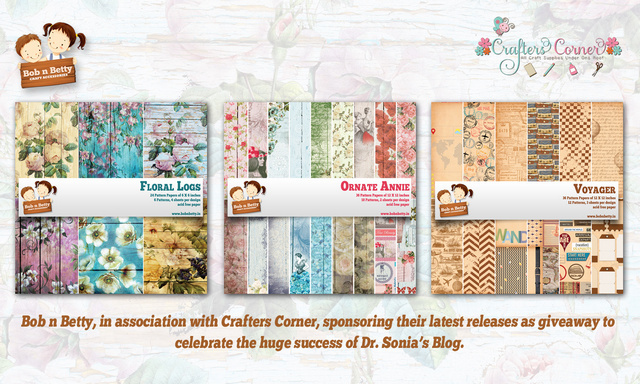 I have already told you about the amazing Shalini Mittal, who owns one of the leading craft supply stores in India, Crafters Corner. Well Shalini is a huge brand by herself and she has literally taken the young Bob N Betty Company under her wings and formed a partnership with them to sell their gorgeous designer papers! 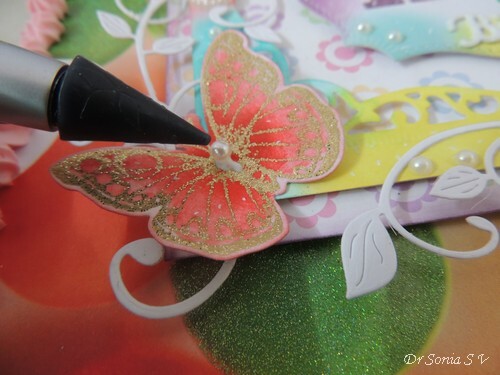 Shalini stocks some big big brands of the papercrafting industry in her shop and a big "thumbs up" to Shalini for supporting local talent in such a huge way! 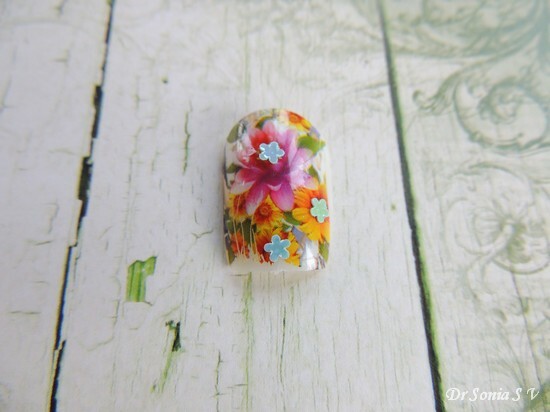 Love how the crafting industry is evolving in India! 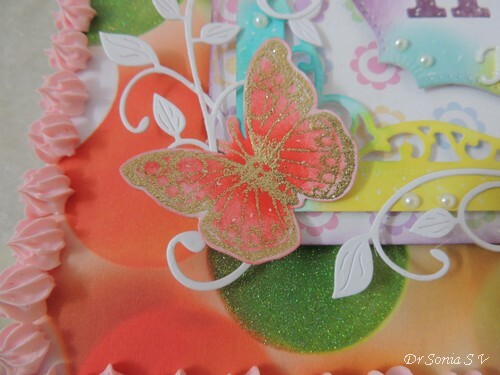 Go to the main Celebration Page and Link up projects inspired by my posts/ tutorials [deadline is April 2nd ].Please mention and link to the post / tutorial which inspired you in your post. You have time till April 2nd to comment on the sponsor posts. 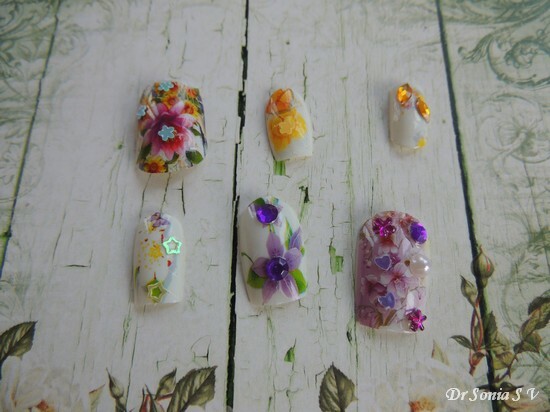 I will announce all the winners here on the blog on April 8th - and there will be 14 lucky winners ! 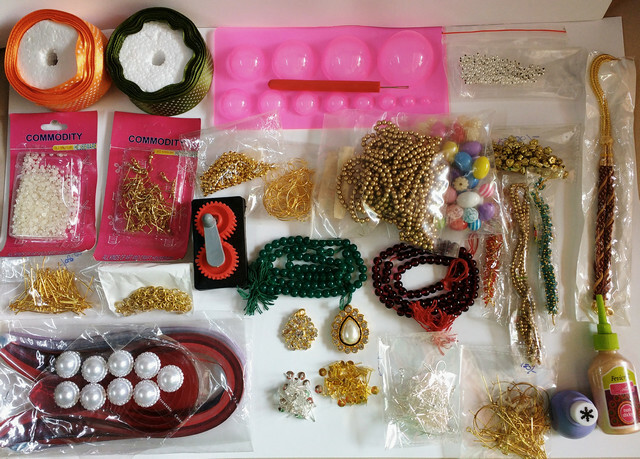 Hi friends announcing the next giveaway which is from a store specialising in Jewelry Making Supplies Zara Beads owned by Mr Raja.And ooh just look at all those gorgeous beads, findings and quilling supplies one lucky crafter is going to win!! 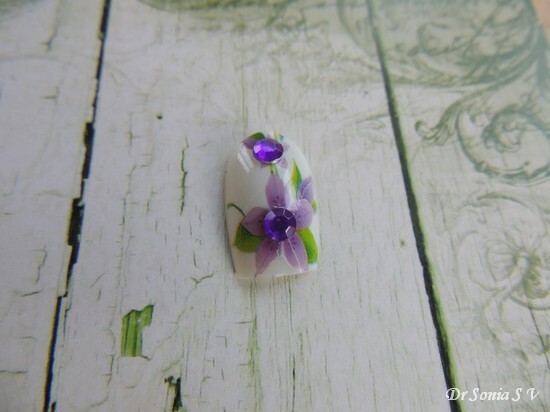 Zara Beads was recommended to me by my long time blogger friend and super talented quilling specialist Shylaashree ! Thank you so much Shylaashree for introducing me! Seeing the amazing response to the celebration events and the enthusiastic participation and comments from crafters worldwide Ms Rashmi the owner of Itsy Bitsy contacted me today and said they will ship the prize worldwide so my dear friends from outside India do comment on the Itsy Bitsy Giveaway post link in case you have not done so : Itsy Bitsy Sponsored Prize[Worldwide eligibility] as you don't want to miss a chance at winning that one! 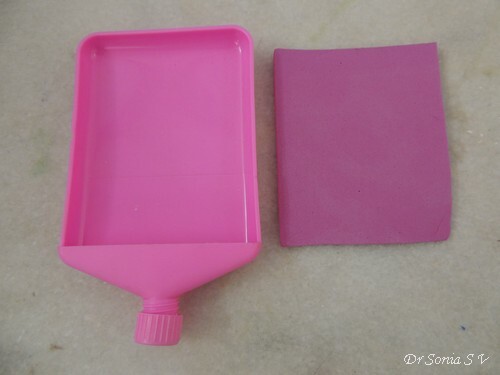 Hi friends my daughter finishes 4th grade this month and will be bidding farewell to her "junior school" teachers .She wanted to make Thank you gifts for five of her favorite teachers and the mini book you see in this post is one of the 5 we made to gift her teachers! 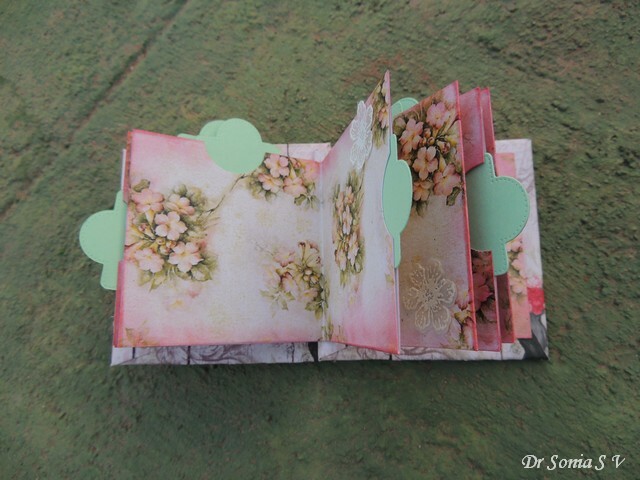 These 3.5 x 3.5 inch mini books are very easy to make and only requires embellishing on the book cover. 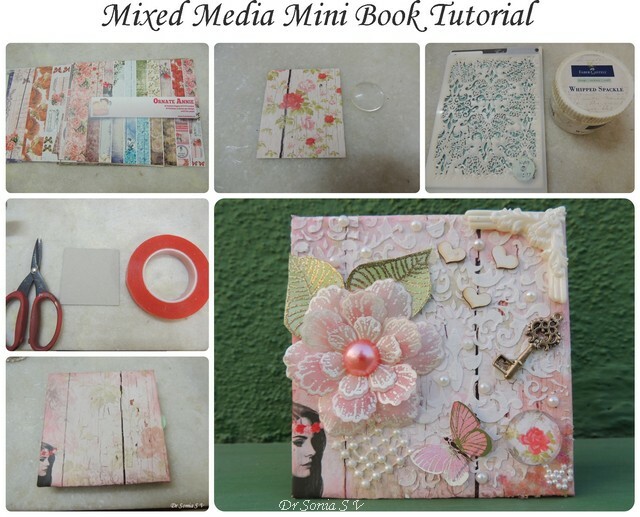 Another mini book I shared earlier[ Mixed Media Mini Book] was extremely popular here on the blog so I thought with the current mixed media craze I will share some tips and tricks on how to make a mixed media book cover in a simple and easy way. 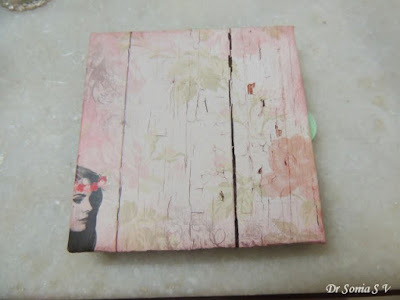 Tip 1 : Choose your adhesives wisely :If you are making your own album / mini book cover and plan to do some mixed media work on it ...adhere your pattern paper on the chipboard using a good strong adhesive such as red tacky tape. 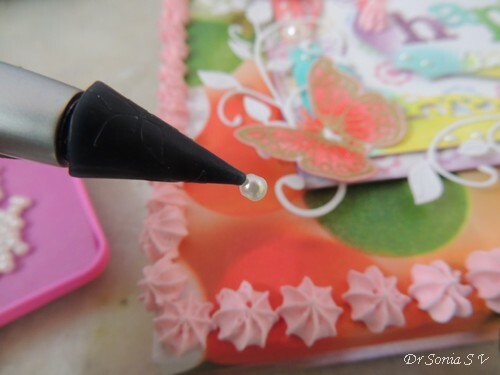 The problem with wet adhesive is if you use more you can wrap and wrinkle your paper and if you use less your paper can lift in places later if you add heavy embellishments on it. 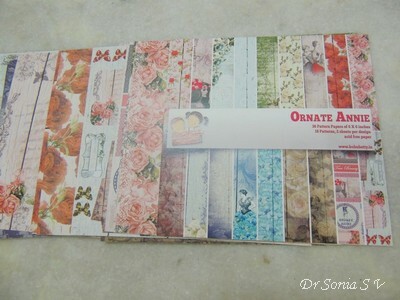 Tip 2: Use good quality pattern paper. Unless you want to spend extra time decoupaging tissue paper or thin paper on your book cover the easiest option is to use good quality thick pattern paper which will take on all our texture paste, ink spraying, heavy embellishments without tearing or crumpling. 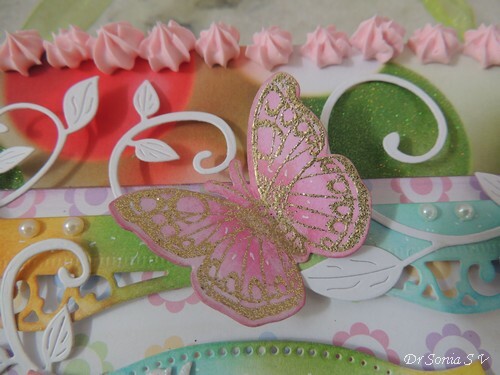 For this project I used gorgeous papers from Bob n Betty [sold at Crafters Corner] and these "made in India" papers have such lovely designs, are nice and thick and have a smooth semi glossy finish! 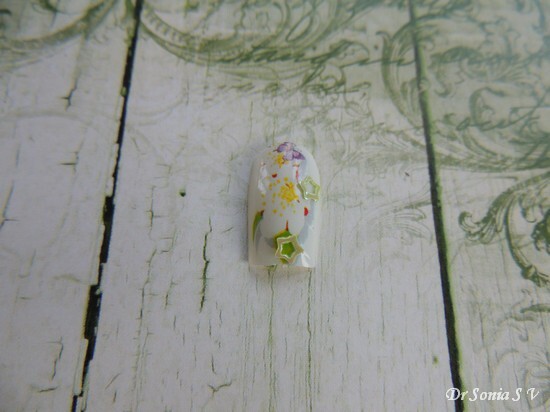 Stencils are a wonderful way to quickly and easily add a subtle yet interesting background . 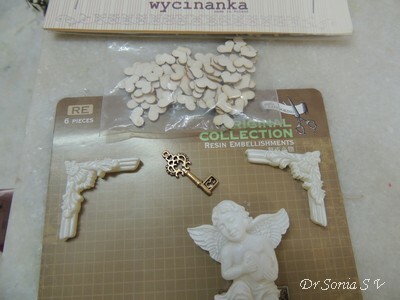 You can use store bought Stencils or make your own with punches, dies or by hand cutting. 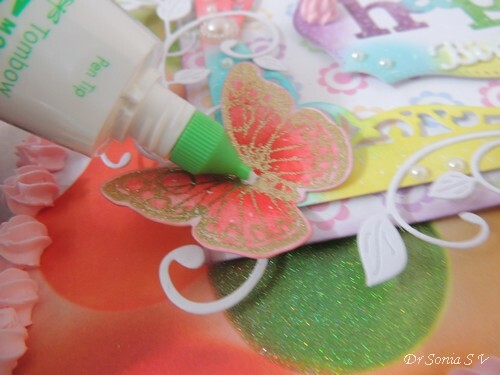 Sponge on your stencil using ink from an inkpad or a bottle of ink, spray ink on it or smear some texture paste. 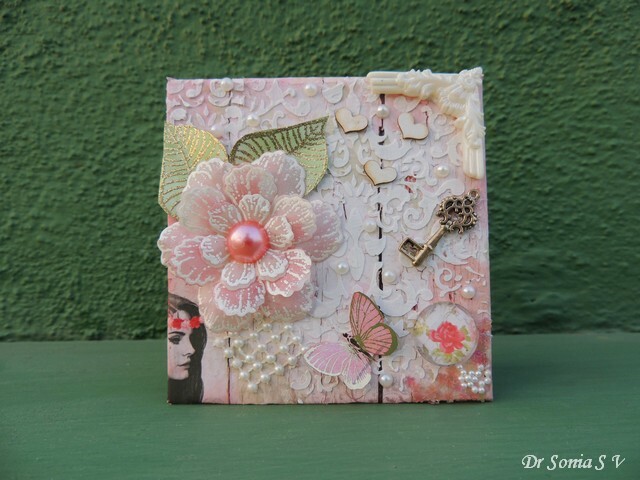 Make your own unique chipboard by layering several layers of punch out or die cut shapes - yes that does require a bit of patience but would be totally cool! 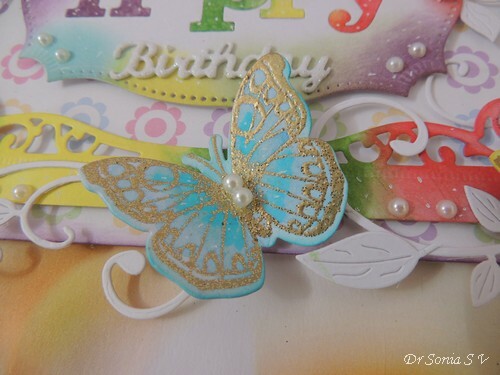 The beautiful butterfly you see was fussy cut and inked from a butterfly pattern paper which was sent to me as part of winnings at Mrs A's Butterfly Challenge . 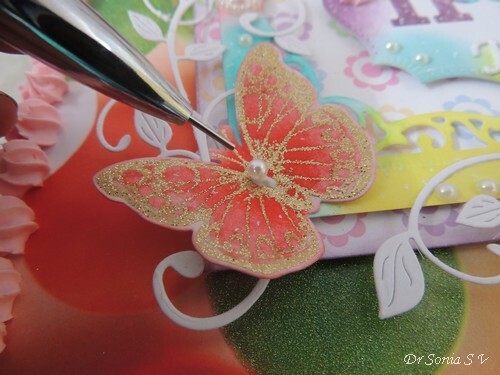 Tip 5 : Add a sprinkling of really tiny embellishments! 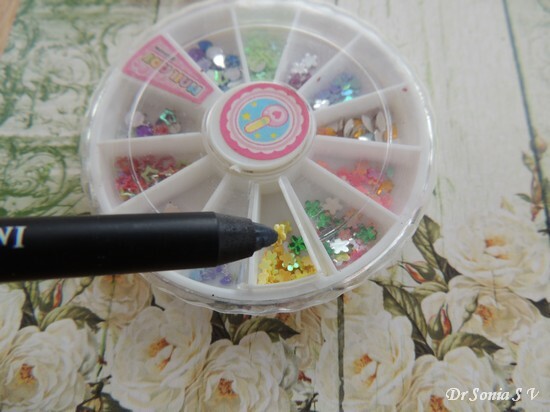 One way to really jazz up your project is by adding some really tiny elements such as glitter balls , tiny pearls, chunky glitter or even cheap nail art decoration items. A sprinkling here and there adds so much visual appeal! 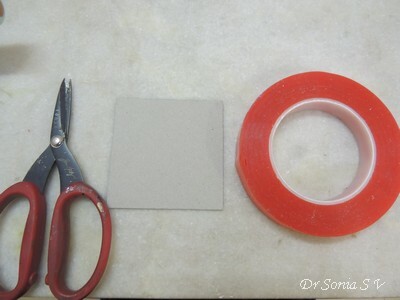 Tip 6. Add a really cool extra something which makes you want to reach out and touch ! 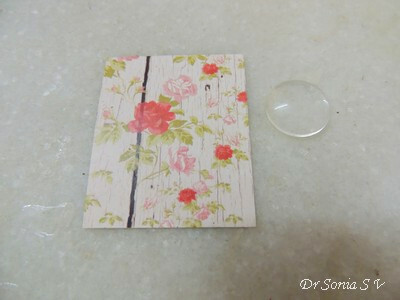 This can be a piece of fabric , the pearl mat in my project , an attractive large crystal or a glass cabochon as shown above! 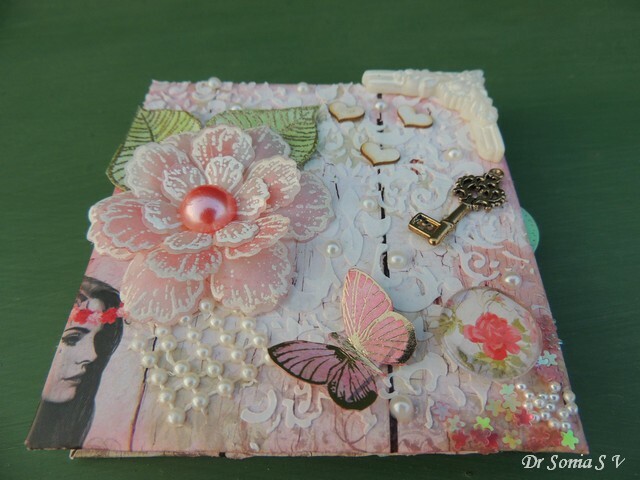 The 3 dimensional layered flower was made by stamping and heat embossing on parchment using Heartfelt creations Botanical Wings stamps. 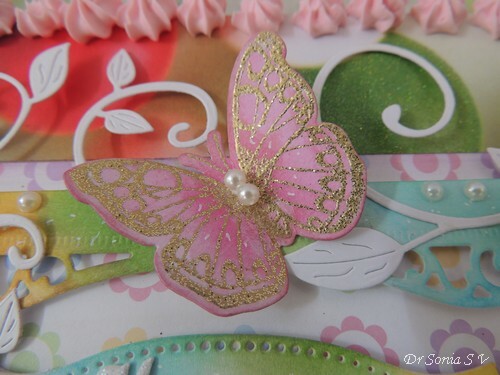 Unless you have a really huge stash of craft supplies ,chances are you won't have matching papers, flowers and other embellishments for a particular project. 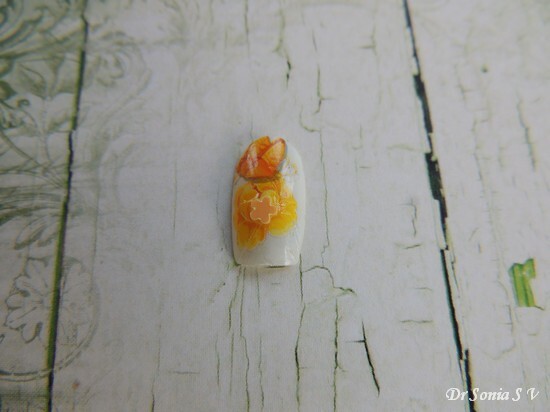 Using a single color of distress ink to ink areas of your pattern paper, flowers and other embellishments can bring on a look of uniformity. 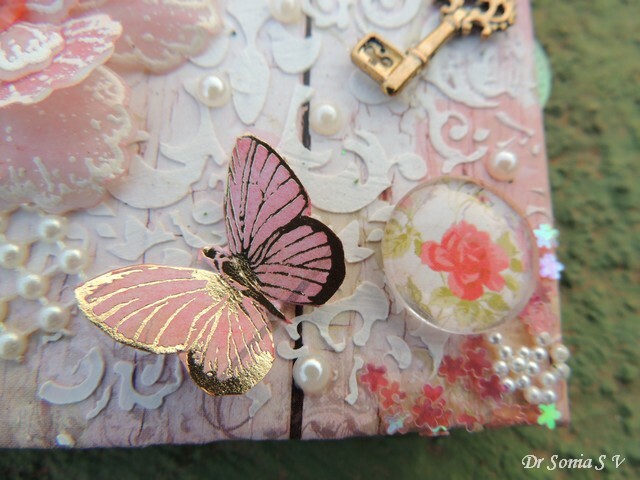 In this mini book I used worn lipstick Distress Ink to sponge the pattern paper on my book cover and the parchment flowers and the butterfly . 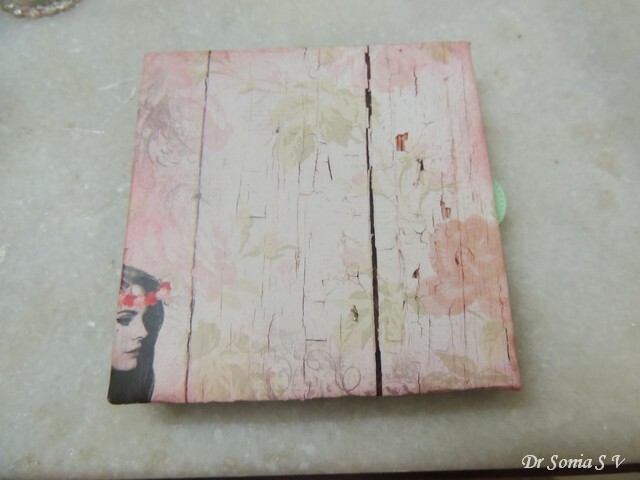 The actual mini book was made using a single 12 x 12 paper from another Indian brand Papericious but since I sponged both the book cover and the inner papers with the same colored distress ink ...they gel well together! All those green tags were made with my favorite Poppy Stamps die and I later on inked them to tone down the bright green[ but sorry forgot to take a picture]. 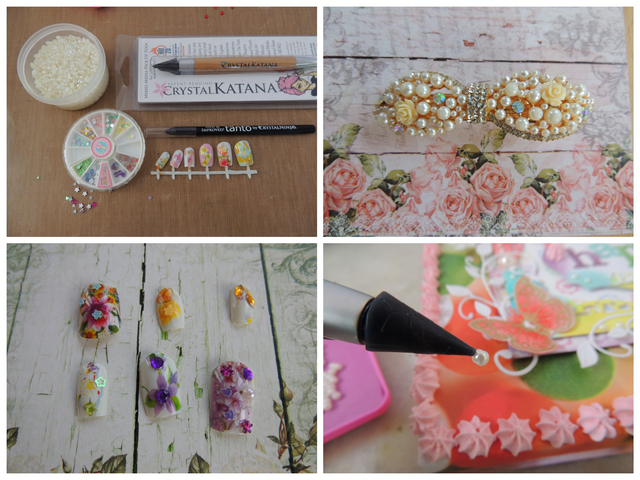 I hope you liked my mini book and hope some of these tips will be useful in your crafty adventures!